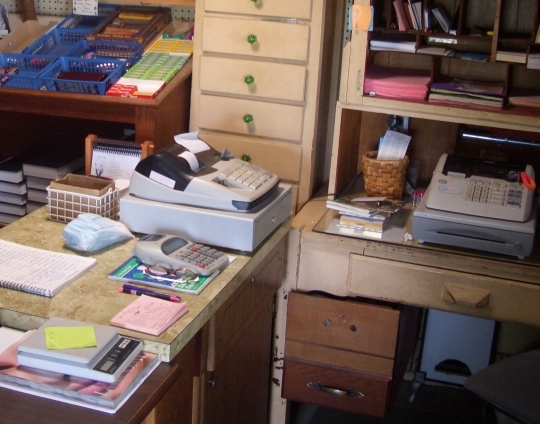 We’ve featured Raber’s Bookstore a number of times on this blog. 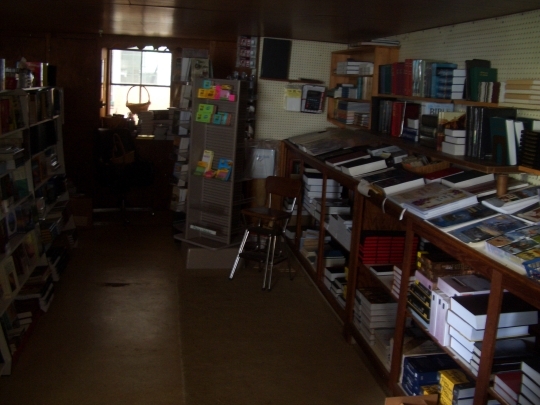 Raber’s is a longstanding Amish book seller in the heart of Holmes County. Mary Raber, who runs the place, let me shoot a few photos during a recent visit. The outside of the shop. It is the building on the left made of cream-colored blocks. The Raber’s crew has plans to move the shop to a new structure which is being readied next-door. Raber’s has a good selection of religious, inspirational, and Amish-themed books. They also have a nice children’s section. Gas-burning Amish lights are strategically placed around the store. You can see one in the background of this photo. It is a bit dim inside Raber’s, but on a day like this one, the natural light coming in the windows lets you see all you need to. The register area. This is where you chat with Mary and pay for your finds. And pick up a business card and purple store pen, if you like. Close-up on the register. Yes, Mary sells a few sweets too. Attached to Raber’s is a stamping shop. We’ll have more on that shop, including photos, in a future post. And: have you visited any Amish book stores? If you enjoyed this post, let us know of any other book shops out there that might be worth paying a visit. This looks like a fun place to visit and shop in. I love books!! I have not been to an Amish book store yet but would love to go. Do you happen to know of any in Arthur, IL? I plan on going to Arthur next week if all works out. I will also check in with the tourist information place in the old train depot but if you know of any Erik that would be appreciated. Miller’s Dry Goods in Arthur has gas lamps that hang from the ceiling. They do a double duty as they provide both light and heat in the winter time. I remember the first time I was in there in the winter. It was quite warm with those gas fixtures going. It was a little dim in some areas of the store but as you said, still plenty of light to see by. There is (was?) 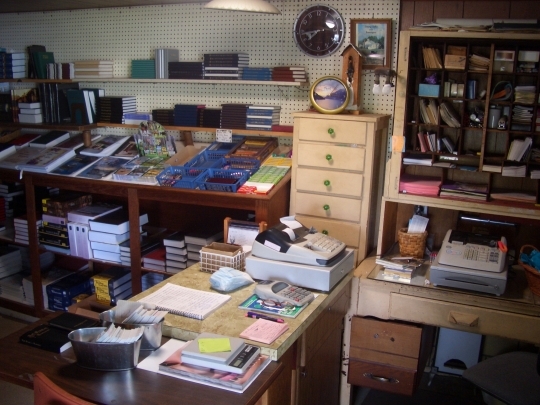 a book dealer a couple miles southeast of town when I was there in 2004, not sure of the name or coordinates though. Thanks Erik!! I printed your info and will look for it while I am down there. I’ll also see if I can find the other one south of town too. I love to read, and frequent the library in my area a lot. I am happy to know that the Amish are aloud to read books, out side of the bible that is. I had heard that books other than the bible were not aloud is some communities, is that true? I love clear view fabrics. A wonderful selection of books. They are Mennonite mostly. They carry readers too. The photos could have been taken at an Amish store I often frequent in Sinking Valley, PA It is owned by two elderly Amish sisters. (Renno sisters) It is charming with greeting cards, quilts, fabric, notions, books, and necessities the Amish need for daily life. They will order anything they are able from a thick catalog they keep under the counter. If you are looking for non-electric appliances, this is the place to shop! How fun! I’ve never seen an Amish bookstore. I wonder if in their new building they’ll have a few comfortable chairs and a Starbucks? LOL! I’ll have to look for a bookstore next time I’m near an Amish area. If anyone would like to visit the shop in Sinking Valley, PA, please email me and I will send you directions. Looks very much like Gordonville Bookstore in Gordonville, PA- just outside of Bird In Hand. I love the rack in the Children’s section … the little denim purses and what looks like maybe a bag of happy face pins or stickers? I don’t know the name of it-but in Waterloo, New York there is a bookstore in the back of the Mennonite Grocery Store. They have Amish and Mennonite novels, childrens books, school books, and more. You are kind of surprised to find a book store in the back of a grocery store when you are going up and down the grocery isles. Of course it is a huge store. Love the pictures. I noticed they had two csh registers and also a calculator. I wonder why two ? ones for the books and the other one for the stamp store! Yes, I have been to Amish bookstores … This one in fact! Haven’t been to an Amish book store, but the Amish stores I go to, they also have several books….. Enjoyed your article, and the pictures…. BTW did you receive my personal email re: butter ???? Haven’t heard from you on it !!!! Those cash registers are set up to run on batteries. The Old Order in that area are not opposed to solar, and the majority seem to have solar panels to run some lights and small equipment like this. Of course, they may just run on AA batteries. In Lancaster County, PA there is a shop on Stumptown Road that has lots of books, lots of quilts, crafts, best homemade soft pretzels, fresh milk shakes, bird houses, clocks, fudge, root beer, cakes, etc. Unfortunaly the Bus tours stop here too. Go to the crossroad of Stumptown Road and Rt. 772 (Newport Rd). Visit the Old Mill at that intersection. A guide will demostrate that the Mill still works. It use to have a post office in one corner. Free tour, but you can tip the volunteer guide. From this intersection, go NE on Stumptown Rd. (crossing 772) for about a mile and look for the beautiful farm with Green roofs to visit this Amish farm. My kind of place! JUST READ! I’ve never ben to Raber’s, but I’ve ordered a number of items from them, from bound books to coloring books—which are truly unique–I mean, how many children’s coloring books have you ever seen with a deer hanging from a tree, ready to be–uh–“prepared”? They’re all obviously hand-drawn by regular people—certainly not anyone trained in graphic design or art. They’re treasures! I had a credit from them for an item they no long carry. I’m waiting for my next order to arrive—it takes a while, but it’s worth it! Thanks for posting the pictures, Erik. I’d like to visit there someday! Tom, you mentioned an Amish bookstore in West Howe(? ), Indiana. Can you tell me approximately how far this is from Shipshewana, and if you know of any other Amish bookstores in the northern Indiana area? Thanks! In Berlin, Ohio, right in the main hub of things, is a Christian bookshop that sells lots of Amish books, fiction & non-fiction, at a really good discount. Also, the big antique shops in that area have some dealers who are selling their Amish novels at a real good price. I remember we went to this Amish variety store way back on a farm somewhere in Fredericksburg, Ohio, and they had a large book and stationery section, and it was just as dark inside as Raber’s looks. In Lancaster County, PA, we stop into the Gordonville Bookstore at 275 Old Leacock Road where I get a copy of The Diary, which is a white pamphlet style newspaper similar to The Budget. 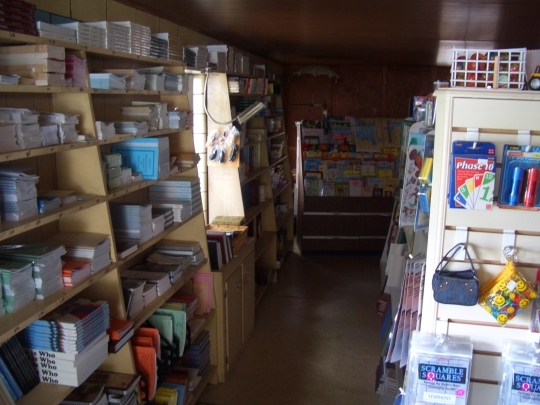 They sell lots of books, stationery, and stamping supplies, and sometimes even foodstuffs where I’ve gotten a hefty zip-sealed bag of local shelled walnuts for $2.00! There’s also a place called JL Bookstore at 147 Amishtown Road in New Holland, PA, but sorry to say I’ve not been there yet. Debbie, that would have been Yoder’s Country Store, near Fredricksburg. It is a the far-end of a very long lane that runs back to several OO farms. I have been there several times – just love that place. In a previous life did this book store use to be a milking parlour by any chance? Oldkat, yes I remember it did have something to do with milk, but can’t recall what she said exactly. Run by two OO Mennonite sisters. Nice selection of books, fabric, childrens puzzles, hats and other items for plain living. I got my church jacket there. Nice ladies. Has anyone ever been to Farmerstown Broom & Book. I am pretty sure that it is going out of business as I saw an “Absolute Auction” of the business in the Bargain Hunter 2 weeks ago…. bummer, it was a nice little shop. Mike – he did indeed pass away a couple of years back and his widow continued to run the shop. She, too, is up there in years and I think it has gotten to be too much. Mary on this last trip I visited Farmerstown Broom and Book and was told the same, that Blind Syl had died a couple years ago. I didn’t hear anything about a sale. The gentleman who was running the place showed me the brooms and broom-making equipment, and said someone else was helping out. We stopped in Delaware at an Amish owned Fabric shop (my wife is a quilter). Now while it had a great selection of fabric, it also had alot of other goods and a wonderful book store. There were a couple of tall book shelves full! Cant remember the name of it, but we spent some money on fabric and books! Found the name of the store…its Shady Lane Selections, in Dover, DE. There is a small, but well stocked bookstore in the coutryside west of Nappanee, IN. The store is right on the Elkhart/Marshall county line. The road is CR100 in Elkhart Co just south of US 6 or 1050W in Marshall Co. The store sits well off the road on the west side behind another set of buildings, but a sign shows you the right driveway. Hi Erik! I really enjoy AMISH AMERICA which I just discovered this fall 2011. My Amish travels are only in Penn. (I live in northern New Jersy and travel alone). I asked an Amish woman about the Jersy Shore area but she could not give me any details so as not to disturb their privacy. Is there a Jersey Shore area along the Susquahana River that is friendly to tourists? I love quilt/fabric shops, bookstores and basically anything Amish. I have a very old copy of AMISH COMMUNITIES and would love to get the newest edition so I can find more of these special little shops. Is there a bookstore that accept mail-orders? I am already looking forward to a trip this spring. If it is any help, a version of the original Luther Bible is available for download from http://www.ccel.org/ccel/bible/delut otherwise, including if you are happy to have an updated language version, these are readily available on sites like Amazon. Further searches may turn up copies of the original version, but these would be in German Gothic script, as I believe Amish source materials are, so you may have difficulties in reading them anyway. Amish On-line bookstores ? A Contradiction in terms ! What a pity that by virtue of their life, Amish people do not run on-line book services. It would be so helpful. On the other hand, if there are online book stores who sell Amish published books, and who take payments online from outside the USA, details of these would be most helpful. It is particularly difficult for people, like me, who are interested but who do not live in North America and short of being able to make a personal visit, or know someone who is able to, is unable to benefit. Similarly where sending a UK bank cheque, to a terrestrial book store in North America would not be any use. I know that there is a fair number of related books on Amazon, by non-Amish or former Amish, so there is no need to take up your time advising on these, thank you. Re: Amish On-line bookstores ? A Contradiction in terms ! Thank you for your advice, although I have discovered them myself. Unfortunately their shipping price is unreasonably high and most disproportionate to the cost of the book I was interested in. Other suppliers from the USA use much less expensive methods of shipping that are not anywhere near as discouraging of doing business compared to Scroll Publishing ! LaGrange because I usually stopped by there at least once each year. It was a unique store and very interesting to anyone interested in learning more about Amish faith and life. Thanks for sharing this Al. I had heard this was in the works but didn’t know where they ended up. It was a nice store in that community, but aligned with what they are saying, every time I went in there it was pretty quiet. I agree with your comments, Erik. I was in the Pathway Bookstore at LaGrange at least once a year the past five years and always was the only customer in the store at the time. I guess local Amish people didn’t go there much nor did many of the thousands of tourists who visit the area each year. I looked up the Bloomingdale settlement in the 2014 Raber’s Almanac. There is only one district listed with only one minister, no bishop or deacon. Must be a small settlement. Is Pathway Bookstores connected to Pathway Publishers of LaGrange IN who publishes the Pathway Readers? 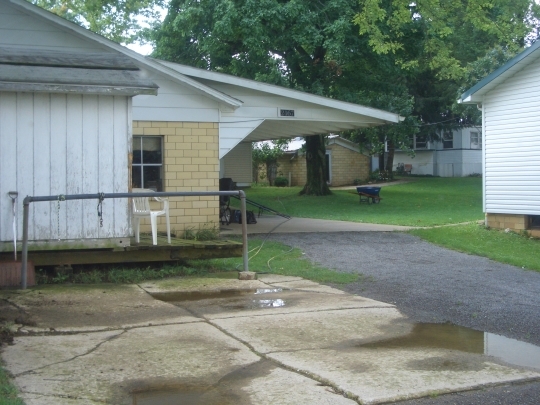 Yes, the main Pathway Publishers “HQ” is actually in the Amish settlement in Aylmer, Ontario, but up until recently they had a bookstore and presence in Lagrange County. That has since moved to Bloomingdale, Michigan. I’m not sure if the Pathway Readers are physically published in the US or Canada though. Is the Bloomingdale address a retail store as well? Do they have shopping hours? Erik, I’m looking for blogs you may have written about your experiences as a traveling book salesman selling to the Amish. Could you point me in the right direction? Thanks!